In today’s competitive broadcast and production environments, where time is money, the last thing you want is for your equipment – VTRs, video servers, A/V routers, still stores, or editors – and operators to be sitting idle due to RS422 or RS232 interface problems. Easy, simple and reliable to use for both experts and non-experts alike. Compact, hand-held device with an easy-to-read four-line x 40-character display, an eight-key keyboard, and separate RS422/RS232 connectors. Simple and intuitive for the technical and non-technical alike. Anyone can perform testing in seconds that once took 30 minutes and required specialized knowledge. Switch-selectable beween RS422 or RS232 for chasing down RS422 to RS232 adapter problems. Confirm without a doubt that two cable ends are connected to the same cable. AC-powered with optional external battery pack. Easily and quickly check system baud rate and parity settings. Four-line x 40-character liquid crystal display. Eight-key keyboard with a rotary knob. 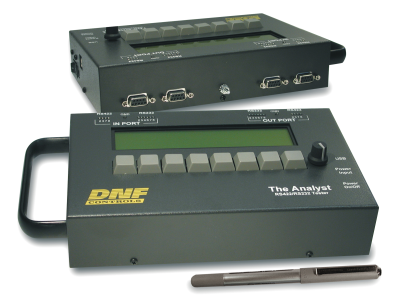 The Analyst RS422/RS232 Tester is ideal to use in remote production setup, new studio builds or facility upgrades, or in maintaining existing facilities and systems.